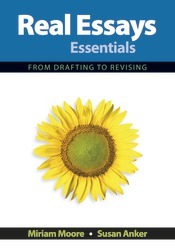 Get Miriam Moore’s advice for planning, drafting, and revising essays—even when you aren’t online! Author Miriam Moore believes in helping students learn to trust themselves as readers, writers, and thinkers. Writing Essentials Online: A Macmillan Launchpad provides a space where students can build both confidence and strong academic writing skills that will carry them forward in college and career. A portable print text, Real Writing Essentials works together with Writing Essentials Online to deliver just the support necessary in order to develop paragraphs and essays. It can be packaged with Writing Essentials Online at a significant discount.